In a roasting pan whisk together orange juice, lime juice, pepper, cumin, oregano and salt. Taste and adjust for seasoning. Add pork, turn to coat all sides in marinade, add onion and garlic, and cover with foil and refrigerate 4 hours or overnight. Bake covered in a 350°F oven for 3 hours or until pork is fork tender. Shred, drizzle with sauce from pan and serve warm. In a hurry use store-purchased orange juice or keep frozen juice in the freezer to plan ahead. 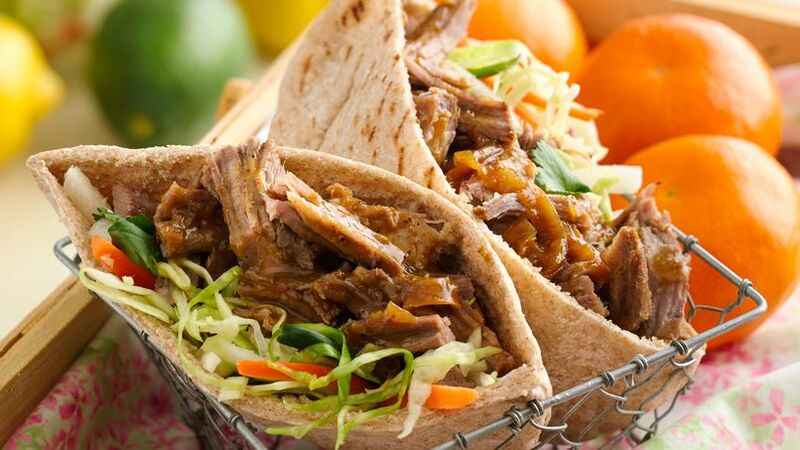 Vianney Rodriguez A fresh orange-lime juice marinade tenderizes this delicious pulled pork. Serve this pork with tacos, over tostadas, as a filling for enchiladas or on a warm roll. Drizzle with pan juices just before serving.